Service-learning at Providence College has led me to reach personal conclusions about what global citizenship means, about my positionality in the world as a white, college-educated female from the United States, and about how my positionality should direct my actions in relationship with others, especially those I encounter across borders. My first trip to Tijuana, Mexico in the Spring of 2016 opened my eyes to the world outside the states for the first time. I came to believe that ‘global citizen’ is a privileged, paradoxical term, and that I did not want to be one. I witnessed poverty at a level I had never seen before and spoke to people I would never have known if I hadn’t left my communities at home. In short, I felt I had seen so much and was faced with the great task of analyzing and drawing conclusion based on what I’d seen, including conclusions about service-learning itself. At the time of the trip I had not yet decided whether or not I believed that all of our actions were harmless or done in best practice, but I knew that service-learning was a much more thoughtful endeavor than your average service trip. While there is much to debate within the idea of ‘service-learning’, there is so much to applaud. For this reason, I decided to attend a second trip to Manzano Uno, Nicaragua with Storytellers in Our Communities. I was drawn to the course in part because my creative writing background makes me a believer in the simple power of sharing stories. I was also compelled to continue my study of global issues across borders in a community with which Providence College has established a dedicated and mutual partnership. Our trip to Manzano Uno has given me the chance to see my global peers in action, to be awed by young leaders who are part of changing the culture of education in their communities, and to partake in an experience that builds knowledge and the potential for social change. The Nicaragua service-learning trip was deeply supportive to my academic experience and my role as a global citizen. I was initially drawn to this service learning opportunity because I wanted another international experience after returning from abroad and was interested in an educative program that works towards community development. Though I had uncertainties at the beginning, within a few days I realized the power of storytelling and how it can build relationships across differing communities. Though the trip began with us facilitating different workshops, by the end it became much more about exchanging our experiences. It was amazing to see the young university students of Manzano Uno to take what we shared and develop it in their own way for the high schoolers. The thoughtful reflections of the university students and their passion for their community and careers inspired me to take a second look at Providence and my future. The partnership between Waves of Hope and the rest of the community demonstrated the power of caring and sustainable nonprofits. There was a strong presence of interdependence among the community, and I hope I can emulate their kindness and ability to rely on each other in future learning experiences. The exchange of stories, reflections, and experiences with the Nicaraguan community was a valuable experience that I am incredibly grateful for. I will carry these experiences with me for the duration of my Global Studies classes, the rest of my time at Providence College, and throughout my career. ​For the past few years,I have been involved with local service-learning and international service immersion trips, but my experience in Nicaragua was more than just another service-learning trip. Spending fourteen days in Nicaragua gave us the opportunity to immerse ourselves in the culture and spend lots of time with the students. I learned so much about the people of El Manzano Uno, their strengths, and the assets of their community. I grew in understanding because the students were so open about their lives and trusted us with emotional stories and aspirations. The students taught me about unconditional love through their relationships with one another. My understanding of global citizenship grew deeper as I listened to the scholarship students’ passions and aspirations. Opposed to leading and serving, working with Waves of Hope was more of a collaborative effort where students were leading one another. Leadership qualities among the scholarship students and my PC peers became increasingly evident each day. Through my service-learning experience, I came to appreciate the value of stories because they inspire creativity and depth among people of all ages, backgrounds, nationalities, religions, etc. Stories make waves that lead people to change things, and make unjust issues just. While watching the students take initiative with their podcasts and workshops at the end of our time together, I felt an overwhelming sense of pride. Watching them each grow in confidence so much throughout the two weeks was so special. They took what they learned from our workshops and added what was important to them; they took it seriously and I admired their maturity throughout all of it. The relationships we built together were authentic, selfless, and genuine. There was a beautiful sense of trust among our two groups and our memories will stay in my heart forever. stories had ultimately defined their character, drive, and aspirations. Not only was I an active facilitator throughout my stay in Nicaragua, I was also an avid listener and learner as well. I learned about the importance of our voices and how each and every person, regardless of their background, deserves to be heard. The relationship created between our community and the community of El Manzano Uno was based off of mutual trust and friendship in which created an inseparable bond. Learning about the lives of the Nicaraguan scholars had left an everlasting impact upon my life. They taught me to never take a single thing for granted and that life is too precious to be wasted on doing something that you do not love. They taught me that stepping outside of my comfort zone was a necessary decision in order to see a brighter future. This experience had taught me exactly what I want to do for the rest of life: to believe, to serve, and to create a positive change in the lives of others. Thus, visiting and learning about Nicaragua was an ultimate life changing experience and I thank God for every moment and memory made there. I was originally drawn to the Storytellers in Our Communities course because of its seemingly perfect alignment with my concentrations of access to education and Spanish. Nicaragua being the location of this service-learning trip and the foundation for this course only furthered my interest because of my unfamiliarity with Central America prior to the trip. 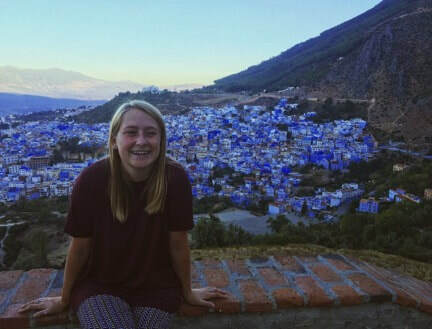 Coming of a semester abroad in Spain, I knew that the timing was perfect to further challenge my ability to converse and foster relationships with native Spanish speakers. While I recognized that Providence College has fostered a strong relationship with Waves of Hope and the El Manzano Uno community over the years, I was surprised just how deeply rooted this connection is. This service-learning trip, which was entirely different than any other service-learning experiences as a Global Studies Major, challenged me to see the need for mutually beneficial relationships in order to have a conducive service-learning environment. As the Waves of Hope Scholars felt comfortable around Nuria and grew comfortable around us in a short amount of time, we were able to spend the two weeks working together towards a greater understanding of how to become the leaders of our own communities. While I was originally drawn to Storytellers in Our Communities because of my interest in the Waves of Hope scholarship program, I left Nicaragua with a completely altered sense of what it means to foster community. Although only together for two weeks, and despite language barriers and other factors that would seemingly divide us, the Waves of Hope scholars and the PC students were able to form relationships using the themes of storytelling and mentorship to draw connections between us. While the time in El Manzano Uno was relatively brief, the connection that Providence College shares with this community powerfully demonstrates that relationships, when formed reciprocally, withstand the tests of time and distance. The Nicaragua service-learning experience has impacted me immensely personally due to the fact that the we were in the country side rather than the city. The geographical location differences allowed to me make this work made the connection personal because of my upbringing. As a child, my family would travel the Dominican Republic every summer sometimes my parents would send me ahead and they would come later on. What is different about these trips is that we did not stay in a resort we would stay at my mother’s child hood home or in our relative’s home in the country side and eventually our home in the country side. Growing up and being exposed the living conditions of the people in the country at an early really has made me be able to realize and check my privilege at an early age. Also experience that live of hard work in the countryside I was able to relate to the people we were serving in Chinandega. The aspect that significantly impacted my civic learning and my understanding of my own global citizenship is my privilege of just going doing the work we did and then just leaving. Being able to just go and leave is a power that I think that people in the community wish could have.